Sunrise, Moraine Lake, Alberta Canada – 2018 photo by theoxernius. 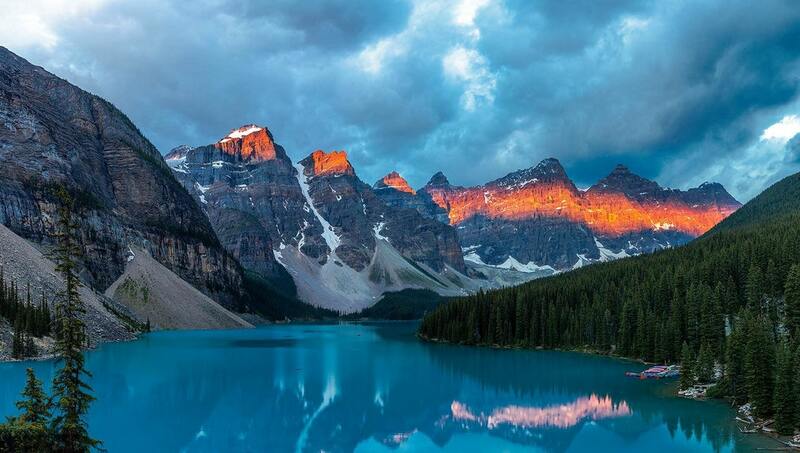 This is the third picture of Moraine Lake that Wrongo has published, including one of his own. This spot is about a 5-minute climb from the parking lot, so everyone who goes near the place takes a similar photo. The distinctive water color is from the sunlight reflecting off of dissolved particles of finely ground rock called “glacial flour”. It’s one of the most beautiful places in North America. Will Mueller breach the castle’s walls? Certainly not just by winning the Manafort trial. Trump has supposedly given Jeff Sessions a “couple of weeks” to end the Mueller probe. If not, Trump will move to fire Ron Rosenstein. As Wrongo has said, Trump has everything in place now to fire Rosenstein from a technical aspect: When the previous number three official as Justice, Rachel Brand resigned, the Senate confirmed Brian Benczkowski, a buddy of Jeff Sessions. He can fire Rosenstein. That brings us to now. Will Trump move on Rosenstein? The negative political fallout could bury Trump. Interesting times. Let’s be frank. A dangerous movement undetected by many is challenging and eroding our great tradition of religious freedom….We’ve gotten to the point where courts have held that morality cannot be a basis for law, where ministers are fearful to affirm holy writ from the pulpit, and where one group can actively target religious groups by labeling them hate groups. This President and Department of Justice are determined to protect and advance our heritage of freedom of religion. Has there been an instance where Christians have been persecuted in this country? Except by other Christians who thought the persecuted ones weren’t the right sort of Christian? We can find plenty of instances where Christians have persecuted others, but neither the Gay Cake decision, nor Hobby Lobby were about religious persecution. How can Christians be persecuted, when roughly three of four Americans self-identify as Christian? Sessions is trying to solve a problem that doesn’t exist. American Christians have the freedom to exercise their religion as they deem appropriate (within reasonable limits, which applies to all faiths). What the GOP and conservative Christians don’t have is the right to use the government to help establish their flavor of conservative Christianity as America’s official religion. If Church and State become one, religious faith becomes a weapon, to punish or persecute those who believe differently. That’s not our America, unless you want your America to look like a Christian version of Saudi Arabia. When the power of government puts its thumb on the scales, it surely will create religious tyranny. Another week of big issues for us to try and thread our way through. It looks like a hot weekend across the country. Good luck to the firefighters in California, it seems that their work never ends. For the rest of us, we can take an hour or so and try to forget about the world’s troubles (and Trump’s) for a while. If you can do that, you will almost certainly be soothed. Let’s get started by brewing up a large cup of Hawaiian Kona ‘Volcanic Estate’ Coffee ($59.95/ lb.) It comes from the Big Island. There, the volcano Mauna Loa creates excellent growing conditions for coffee trees. Volcanic Estate coffee is grown at between 800 and 2,500 feet. It has a light acidity that is complemented by slight chocolate and fruit undertones. Feeley performs for nearly 20 minutes without a break, and without a score to follow. Those who read the Wrongologist in email can view the video here.